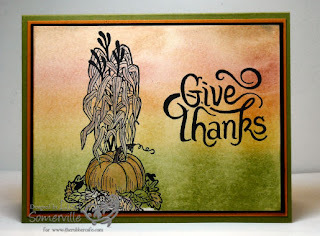 Designs by Lisa Somerville: I'm Back with some news to share! I'm Back with some news to share! Whew....I'm finally back and blogging. I had a great time working with Robyn, Shelley, Gerrie and Michelle in the Artistic Outpost booth at the Rubber Stamp Expo in St. Charles this past weekend! It was great to meet all of you who stopped by to shop, see our demos and Make & Takes! Those who shopped the AO Booth were among the first to see the new releases coming October 1st - I can't wait to share my artwork with these new plates! I've got some exciting news to share too. I received my October issue of Vamp Stamp News - and I have 2 cards published in this issue. One of my ISC cards using Walk in the Woods is on the front cover, and one of my Vintage Halloween cards using Artistic Outpost images is in the centerfold! My other exciting news that I've kept a secret is that I'm now designing for The Rubber Cafe - they have some great images in their store - and I'm sure if you read my blog you all know how I love to color! The images shown in this post are from The Rubber Cafe. congratulations Lisa for the publications & new DT gig! 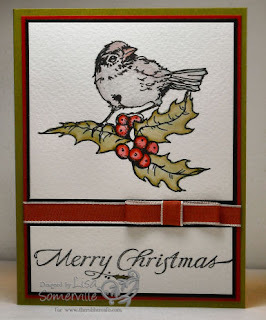 Lisa, congratulations on your card publications and joining a new design team! Your cards are beautiful! WOW...a front cover & centerfold! That's too much! CONGRATULATIONS! And, designing too? I can't take all of this excitement!! Yea for Lisa! congrats on the new dt! it was great to work with you this week end..can't wait to see your new plate creations. congrats on the publications!! great cards too - see I need to add to my wish list now. :) very nice coloring too!! oh wow you are just full of news today!! Congrats on the DT spot, they are so lucky to have you!! The images are beautiful, my jaw dropped seeing what you did with the bird image, just so pretty!! What gorgeous cards! I really love how you did the sky on the 2nd one, awesome! Beautiful! Congratulations on the new DT position! They are lucky to have you! WTG Lisa! !Can't wait to see your cover! I love the cards you made for the rubber cafe' The bird is colored beautifully!! !